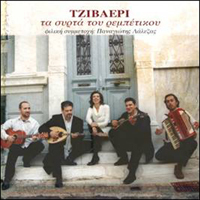 For the first time you can find in one collection the best folk greek songs- syrta and kalamatiana- written by the biggest popular greek composers like V. Tsitsanis, G. Mitsakis, G. Papaioannou, M. Vamvakaris, D. Bagianteras, M. Xiotis etc. Favourite songs like “I Vaggelistra”, “Pame sto Faliro”, “O Zeppos”, “Siga tin amaksa”, Ta petalakia”, “Kaiki mou Ai Nikola” etc. are played by the band Tzivaeri and P. Lalezas, with a dancing mode, that will definitely make you dance, too!